For ideal transport and secure storage of your Light Weight Deflectometer TERRATEST 4000 USB or TERRATEST 5000 BLU we recommend our sturdy transport box “MILANO”. A light aluminium profile and robust 22 mm plywood boards make up a solid box, which will accompany you safely. 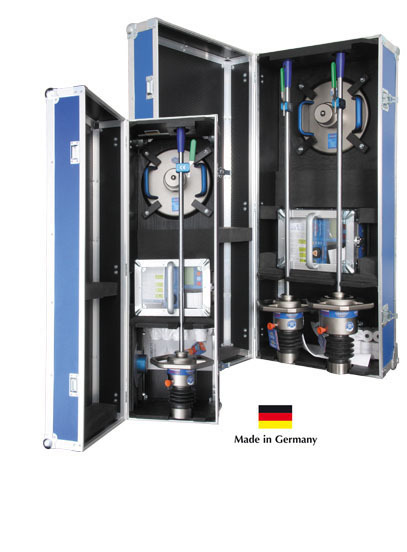 Another feature are the wheels, which have been integrated at the corners on one side for convenient handling and loading of your Light Weight Deflectometer. With this robust transport box you can transport your Light Weight Deflectometer safely and professionally over the course of many years. An investment, which is worthwhile. 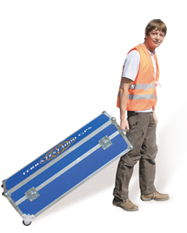 For combined transport of the 10 and 15 kg loading devices in one box we offer you our enhanced model “ROMA”. Naturally, our high-quality transport boxes are handcrafted in Germany. A genuine branded product for your high-quality TERRATEST Light Weight Deflectometer.